The Wellness Expo went GREAT!! A ton of employees and their families came out to this great event held for my government organization. The committee that put it together, the volunteers, and all the vendors did an excellent job. 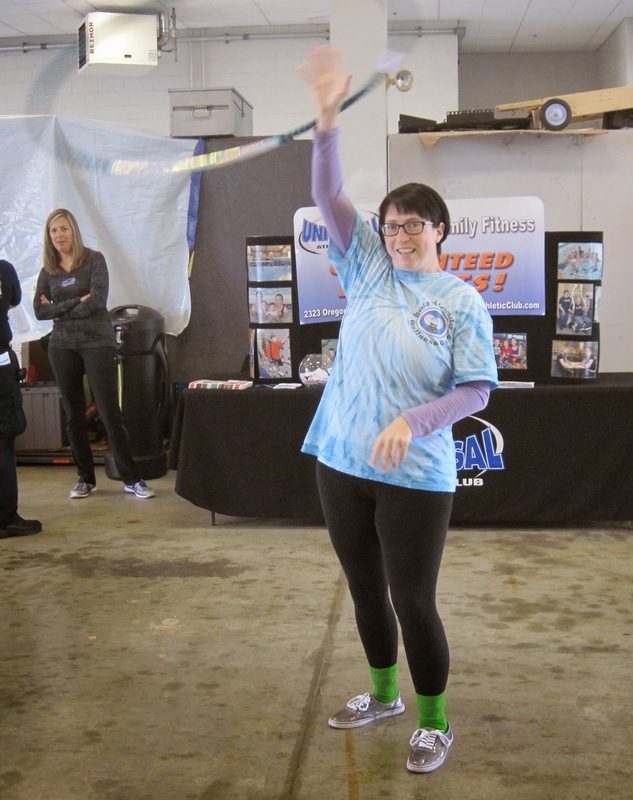 My job was to give hooping demonstrations and tell people a little more about hooping as an exercise. I also encouraged adults to sign up for classes, as I had flyers for both Studio Spin and Jenny. Oh, and I got them to try to hoop. 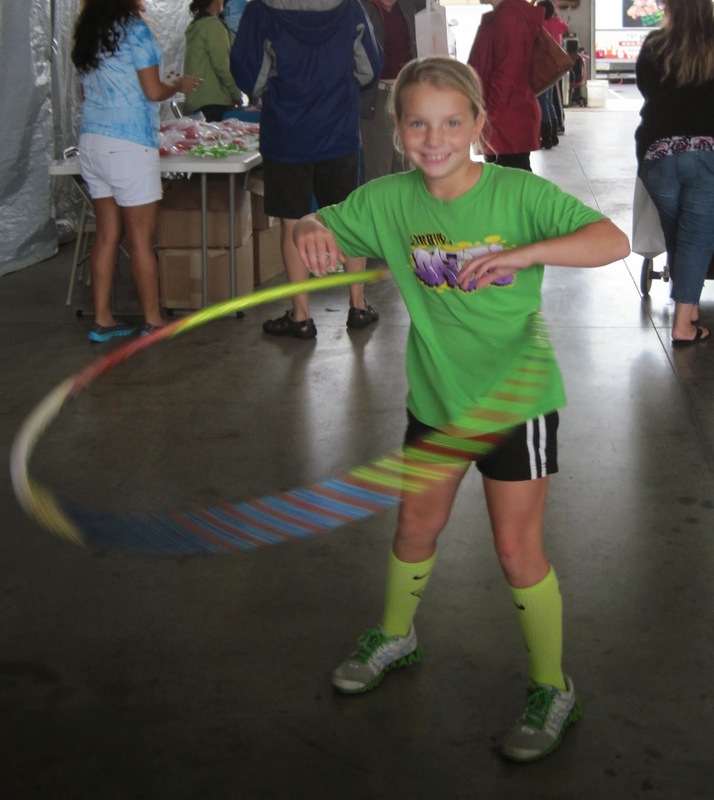 Adults and kids came up to my table to give a hoop a spin, such as the young lady here. 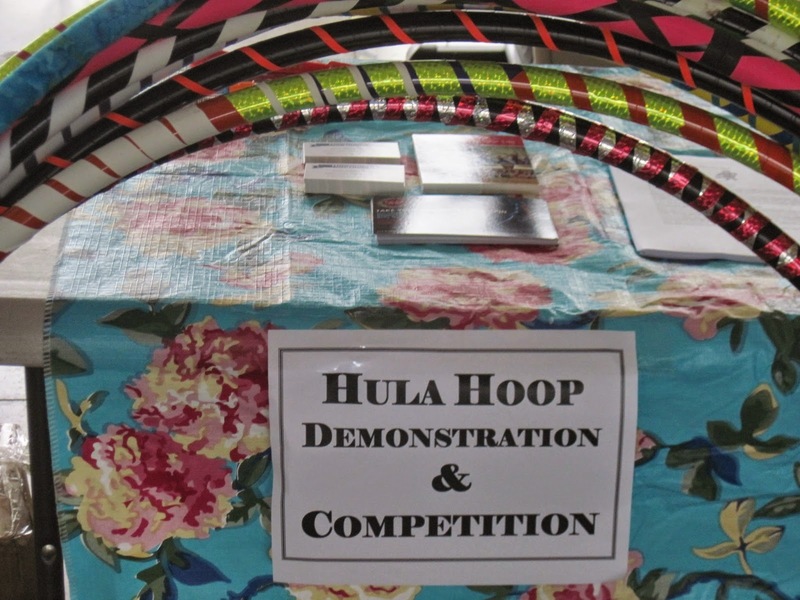 A lot of people gave hooping and go and expressed more interest in it as an exercise. I was happy to supply more information. It was a busy day. I did a lot of hooping, both on my own and as demonstrations. I even got one of the commissioners for our county to hoop, and he was pretty good! I also thank him for being an excellent sport. The day started off crazy. CRAZY! There were so many people. They all had free food, there were prizes to give away (I hear HR is doing the drawings today! ), and there were tons of activities for people to participate in, besides hooping, of course. One such activity was Zumba, and it was Chrissy from Studio Spin! I thought she looked familiar, and went over to talk to her. I noticed that she had the same postcard about Studio Spin that I had, and I finally made the connection. I introduced myself and told her I was one of Katie’s students. Very cool! At one point, though, I had to cut loose. There was a big, open space, a DJ, and the foot traffic had really died down late in the afternoon. I asked to the DJ to play “Royals” by Lorde, a song we frequently hoop to in class. I then proceeded to a give a little show. It was fun! I asked my friend Steph, who was manning the jump rope competition, to take some pictures of me to share with you guys. Here I am! I this event becomes a yearly thing. I think once people hear about how great it was from their coworkers, they may get it in their heads to come next year, and I hope they do. If I can, and if they’ll have me, I’ll be back.